On 16 August, after the nightlong cruel persecution and torture of the students of Jahangirnagar University at Bhashani Hall by the Chhatra Dal, Kamrul Islam, honours 1st year admission candidate and Shibir worker, received the honour of martyrdom. 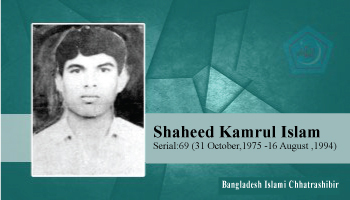 He was resident of Jafarullah village of Nabinagar thana of Brahmanbaria district. Room No. 322, Jahangirnagar University 70.